The story in this game is unfortunately weak. You are Leon, a whiny little kid that survives an attack on his futuristic colony by jumping into an unmanned spacecraft, Juhudy. Unknown to little Leon, Juhudy is much, much more important than he had hoped, and was soon doing missions to try to deliver it to the military. The story is interesting, but not that great. Also, the characters are the most annoying ones that I have ever seen. Leon spends over 95% of his time whining: \'No! I won\'t help you kill anyone else!\', and the rest of his time is spent destroying mechs. Also, the game is a horrendous 5 hours long. This is the greatest part of the game. Without a doubt, this is control defined. You can boost your mech ahead and use special attacks depending on whether or not you are boosting. Put up a shield when the enemy attacks, and then swing around and cut him in half with a blade, causing a dazzling explosion... and then repeat. 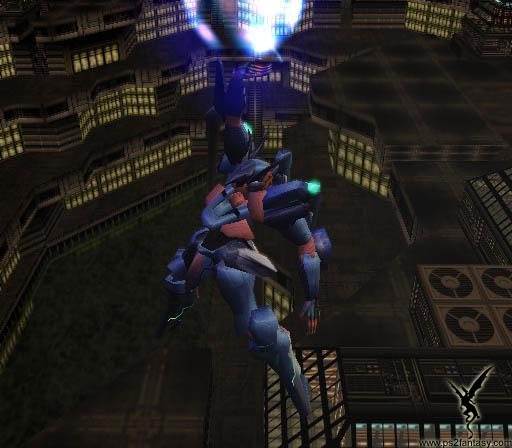 The gameplay of Z.O.E. is intense and controlled, a model of what gameplay should be. Superb. Even now, the anime-style graphics shine, and they look fantastic. Some of the character models aren\\'t very detailed, but it?s a fairly old game. With dazzling particle effects and stunning battle animations, this is a high point of the game. Pretty good. The music that plays while you\'re battling is upbeat enough for a battle, and the rest of the music is just okay. Most of the music that you\'ll be hearing is from battle, though. The explosions when you destroy a building, the clash as you grind your blades against another mechs, the roar as you fire a charged ball of energy... the game has many different sounds, all of which are great to listen to. The learning curve for the game is pretty quick, and there\'s a tutorial if you need it. The menu is easy to navigate, and there\'s even a map to let you know where everything is, including enemies, items, etc. I didn\'t encounter any slow framerate or glitches. This is definitely one you should pick up. At under $10, this is not a game you want to miss. The fast action and intense gameplay makes up for the \'meh\' story and the awful characters. Game points: 45/50 Appropriateness: 44/50 NOTE: Please keep in mind that none of this review includes the Metal Gear Solid 2 demo.